After a day of rain (and jokes about schools closing on account of light drizzle) the snow finally arrived. 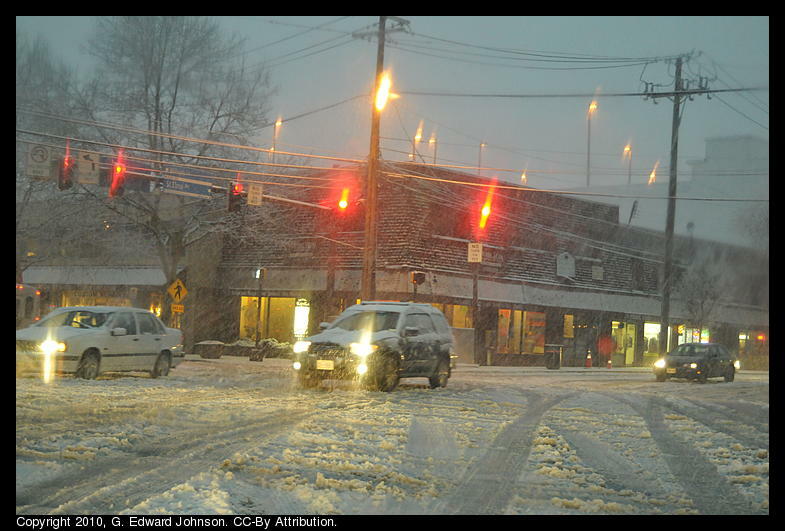 Wet snow coming down at a rapid rate, just like the weather people promised. Traffic, which was moving steadily at 4pm was barely crawling by 5pm It took me 45 minutes to go about 3 miles leaving downtown Bethesda, MD. 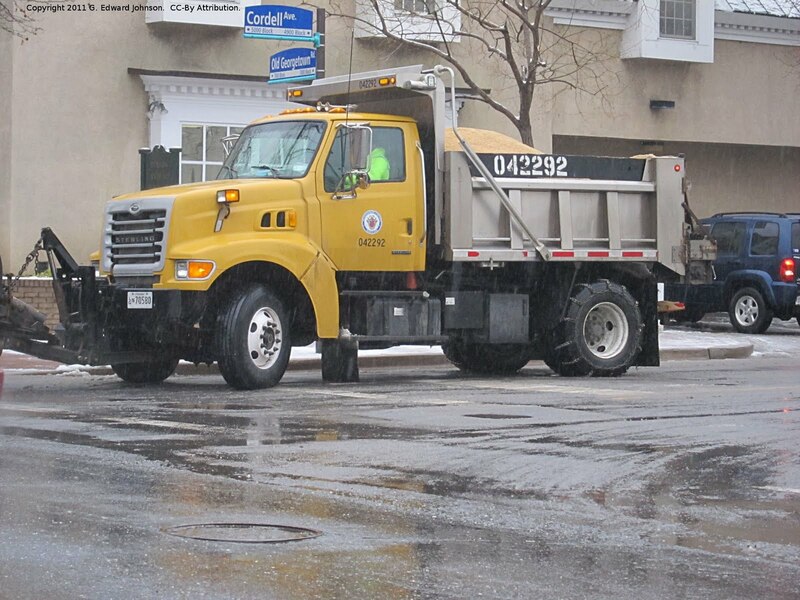 The plows that I had seen earlier in the day were strangely absent. I'm not sure if they were on higher priority roads or just stuck in traffic like the rest of us. We should get around 5 inches and most of it will be done by midnight. Hopefully the road crews will have enough time to clear out the roads for the morning but I wouldn't be surprised to see Montgomery county schools closed for a second day. Metro is famous for using vague wording. 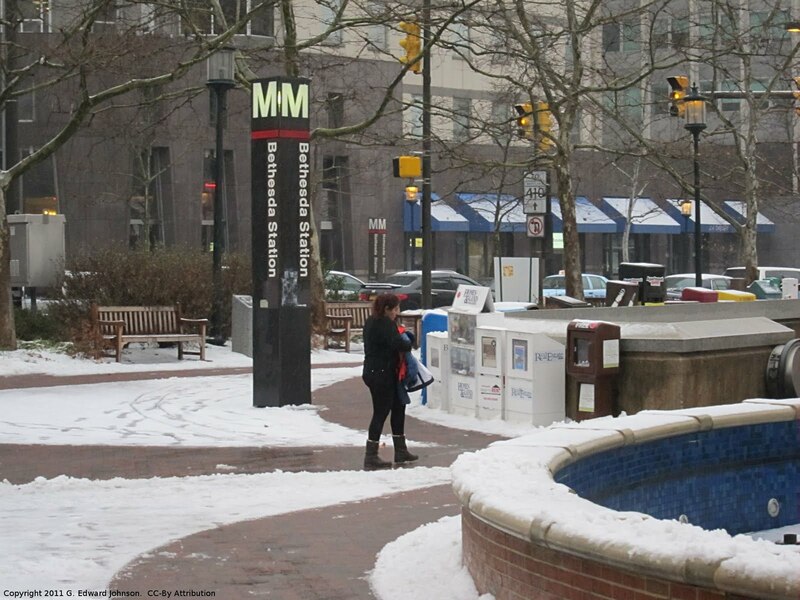 Currently the are reporting "Track Problems" at Bethesda Metro Station. There are probably a dozen emergency vehicles around the station and they aren't letting people down the escalator. A co-worker of mine reported being smelling smoke in the station. The fire department tends to overreact when things involve metro so it could be minor. I woke up early this morning to the sounds of ice pellets hitting my window. That always gets my attention. Overnight we got a little snow, followed by some ice pellets, then it warmed up a bit and it changed to rain. As I write this we are back to ice. Montgomery County Schools are closed today but that seems to be more fear about what could happen later today than current conditions. The forecast is for rain/ice this morning then this afternoon getting some snow. 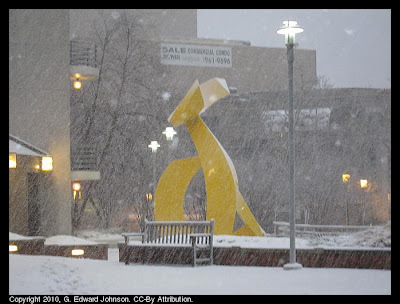 It looks like Bethesda, MD will get 4-6 inches with more to the north. It could get messy this evening with the rain/slush turning to ice. For those of you new to the area that means everyone should go to the food store over lunch and buy all the milk, toilet paper, bread, and chips. Then, leave work 15 minutes early to "beat the rush" and get stuck in traffic until around 8pm. 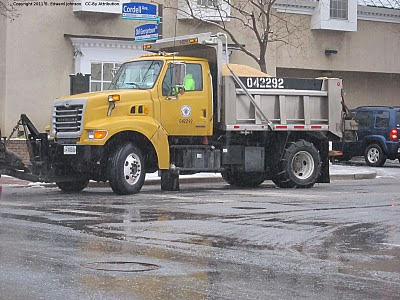 Montgomery County plow trucks are out, there isn't a whole lot for them to do at the moment but I did see one waiting on a side street and the one pictured was pushing the slush off the road on Cordell Avenue. 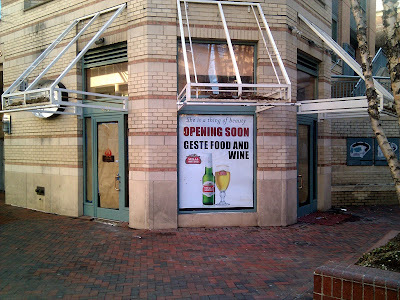 Another Food and Wine place is about to open in Bethesda, MD. 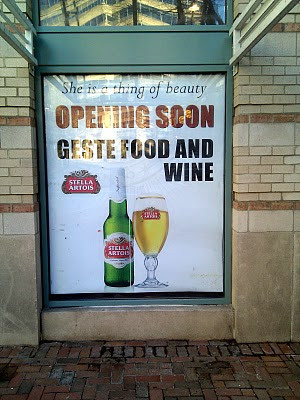 Geste' Food and Wine will be offering Beer & Wine to go, with a Cafe offering Pizza, Salads and Sandwiches. This looks like it will be a neat little place to have lunch, the menu includes Pizzas (white, Chicken Al Pesto, Margherita, Caprese and others), Salads (Calamaportebello, Arugola, Greek, etc) and Paninis (Chicken Pummaro, Prosciutto & Mozzarella, Calabria Turkey, etc). 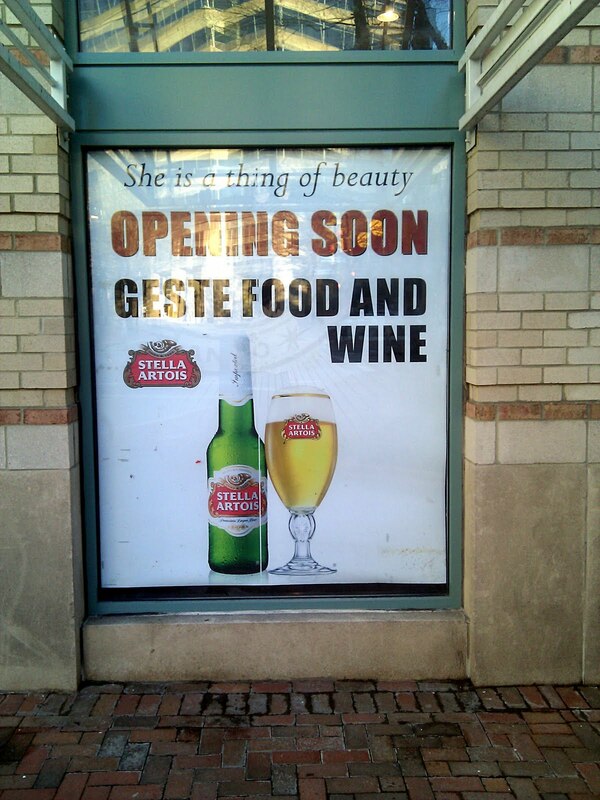 This looks interesting and I can't wait till it opens so I can try it. They do have to decide on how they will present their name. The sign says "Geste Food and Wine", their Craigslist posting (for manager/cashier) says "Geste, Foods & Wines" and their website says "Geste Wine & Food". Montgomery County, MD has a great service that notifies you about school closings, severe weather, and other emergencies. It is called Alert Montgomery and it can send the alert to you through email, text message, or pager (I can't recall the last time I saw someone with a pager). It is very customizable too, there are around a dozen categories of alerts with many options within them. For instance, I have signed up to receive alerts for severe weather, rush hour traffic, police alerts for my district and school closings. If you have kids in a public school you can sign up for alerts for that specific school as well. If you are not into email they are active on twitter and facebook too.